The first edition of A Natural History of Camden and Rockport came out in 1984, written and illustrated by local resident E.C. (“Beedy”) Parker. Recently, she decided to issue an informal update and began gathering anecdotal information from naturalists and friends on how the nature of midcoast Maine had changed in the intervening three decades. What she found is unsettling. Her observations fall in the realm of “natural history,” a somewhat antiquated field largely replaced by the science of ecology and its sub-disciplines. Naturalists tend to make more general notes of plant and animal life as they are shaped by geology, climate and human uses. In some ways, Parker’s book is reminiscent of early 20th-century nature journals, being one naturalist’s informal portrait of place. More people are “glued to devices” these days, acknowledges Parker’s longtime friend Esperanza Stancioff, but she sees a strong resurgence of citizen scientists involved in organized efforts like the program she helps coordinate, the University of Maine’s Signs of the Seasons Program. People attentive to changes in nature, Stancioff finds, often like recording observations that they know will be useful to scientists and policy-makers. Data from backyard observations can be limited (even, in Parker’s words, “sketchy”), but taken collectively they reveal declines and disturbances in the natural world that should sound alarms. Many of the observations reported by Parker reflect broader and widely publicized changes: declines in bees, butterflies, bats, frogs, toads and songbirds; an explosion of deer ticks (virtually unheard of three decades ago); the spread of invasive plants like multiflora rose and bedstraw; and a parade of new insects that threaten hemlock, ash, hackmatack and beech trees along with viburnum shrubs and harvests from many berry and stone-fruit plants. 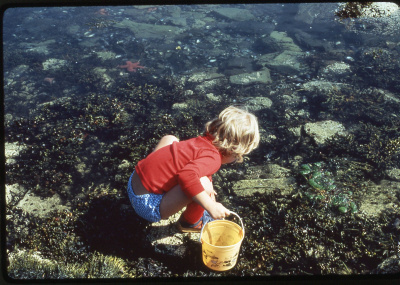 The most dramatic change Parker found occurred in the rocky intertidal zone, a setting she sketched in 1984 with multiple rockweed species, blue mussels, periwinkles, barnacles, coralline algae, hermit crabs, pink encrusting algae, Irish moss, green sea urchins and northern sea stars. (The accompanying photo from 1979, taken in Penobscot Bay, depicts that abundant marine life.) While the rockweed remains, much of the other intertidal life has disappeared. Parker’s update also highlights the region’s increasingly erratic weather, with extreme temperature swings and heavy rains. Local reports of intense downpours (even in the midst of drought) reflect findings that “extreme precipitation” events in the Northeast have increased by 71 percent between 1958 and 2012. Scientists attribute this to higher rates of evaporation and the atmosphere’s capacity to hold more water vapor as it warms. When Mutel was born in 1950, record-breaking highs and lows in the United States occurred in a 1-to-1 ratio. “But since the 1980s,” she writes, “the number of unusually hot days and nights has steadily increased… while the number of exceptionally cold days and nights has decreased and is now the lowest on record.” By the middle of this century, the ratio is expected to be 20 to 1 and in the first three months of 2012, as she was writing the book, it was already 17 to 1. There are unnerving echoes between these two natural history accounts – one tracking changes in the country’s heartland and the other on its easternmost outpost. Reading the observations of Mutel and Parker, I envision a spinning top – as its steady centripetal movement slows into loopy lurches. We can still act to limit future climate change, but clearly natural systems are already off-kilter.